After packing the bedrooms, living room, kitchen, bathroom it’s time to take care of the outdoor area – yard, porch, patio and balcony. Your outdoor belongings need as much attention as your kitchen or living room items. The following checklist may help you deal with this task successfully and move your outdoor belongings to the new location safe and sound. With the moving day just around the corner, you will want to take all necessary steps to move all household items in one piece. Preparing your outdoor items for the move. 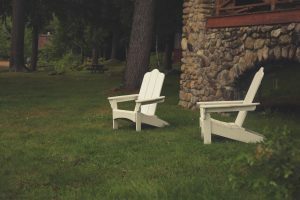 Being exposed to the outdoor conditions, your items may get dusty or really dirty, so make sure to wipe down and clean your outdoor furniture. Transporting dirty or wet items may contaminate the rest of the items in the moving truck. Just picture the situation where dirty garbage can is placed next to your clothes or kitchen items in the moving truck. – Make sure insects are not transported along with your outdoor belongings. Leave bugs and critters behind when moving house. Some outdoor furniture pieces may be large or oddly-shaped. In order to ensure smooth relocation of your items, disassemble them safely if possible. If you haven’t saved the original packaging and manuals, try to find dismantling instructions on the internet. Keep all small parts in a bag or plastic container and have them handy when you reach your new home and start reassembling your outdoor furniture. Keep the bag attached to the large pieces. Also, it’s a good idea to note down or take photo of every step while disassembling the furniture. You may find those notes or photos helpful when you start putting the furniture together. – Get quality and durable packing material. Wrap fragile items in lots of bubble wrap, put padding on sharp edges so as to prevent injuries while carrying the items. Take off glass parts and wrap them well. Depending on the type of the move you will decide whether it is possible to move your plants with you. However, if moving plants is doable, prepare them a few weeks ahead. Prune, remove dead leaves, remove pests and weeds and tidy up the plants. If you are unsure as to how to transport them safely, get professional advice. Get suitable containers and protection for your plants. Label the boxes properly so that your movers know how to handle them. Remember to unpack them as soon as possible and let them adjust to the new environment. – Involve all family members. Have your children prepare their toys for the move. Also, don’t forget to pack your pet’s items. – Clean your storage area. Decide what to move and what to throw away, sell or donate. – Organize a garage sale so as to get rid of all unwanted or unnecessary items. Also, contact your local recycling center and find out how to have more eco-friendly move. It is important to think about your environment when moving house. After packing furniture and other items, clean your balcony, porch and yard. Whether you are the owner or the tenant, leave the property in the same condition as it was when you first moved in. If you intend to sell the property, make it look tidy and attractive to the potential buyers.